Courtesy of Barrio Brewing Co.
Beer Buds Sausage Pairing. Get your sausage and beer on when Dragoon Brewing Co. and Pueblo Vida Brewing Company head over to Ten55 Brewing and Sausage House for an Arizona Beer Week special sausage flight and beer pairing. The breweries will be creating three specialty sausages to be paired with beers. Groovy and juicy! 11 a.m. to 11 p.m. Wednesday, Feb. 13. 110 E. Congress St. Details here. Ciao Charlie Ciao Beer Dinner. 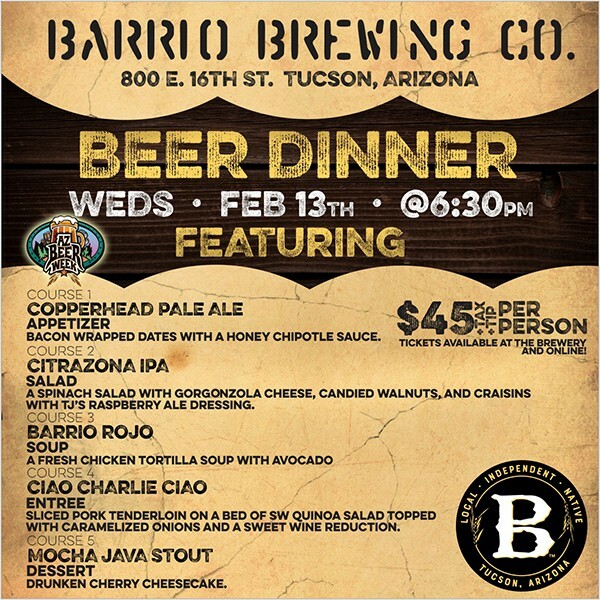 Barrio Brewing is honoring the retiring Charlie Papazian, founder of the Brewers Association, with a special dinner. Enjoy five beers over five courses. Dishes include: bacon-wrapped dates, drunken cherry cheesecake, chicken tortilla soup, pork tenderloin and more. Beers include a citrazona IPA, Barrio Rojo, Copperhead Pale Ale and more. 6:30 to 8:30 p.m. Wednesday, Feb. 13. 800 E. 16th St. $45. Details here. UA Public Art Tour. Even if you’ve been to the UA Museum of Art, there’s probably lots of art on our local university’s campus you aren’t familiar with. In fact, even if you are or were a UA student, there’s likely a whole host of sculptures, fountains, mosaics and more that you walk by every day without noticing or knowing anything about. Let a museum docent guide you through campus and teach you more about the art that’s been hiding in plain sight. 10 to 11:30 a.m. Wednesday, Feb. 13. Begins at UA Museum of Art, 1031 N. Olive Road. Free. Details here. Alexander String Quartet with Pianist Joyce Yang. Let’s get stringy! The Alexander Quartet, in from San Francisco, is teaming up with Grammy-nominated Cliburn Competition medalist Joyce Yang for this performance hosted by the Arizona Friends of Chamber Music, and spanning the full history of music for piano and strings. From Mozart’s Piano Quartet in E-Flat Major (one of the genre’s first major efforts) to Robert Schumman’s crowd pleaser Piano Quintet in E-Flat Major to a brand-new piece—Quintet with Pillars—by contemporary composer Samuel Adams. What a plucky lineup and lucky audience. 7:30 p.m. Wednesday, Feb. 13. Leo Rich Theater, 260 S. Church Ave. $30. Details here. Events compiled by Briannon Wilfong, Emily Dieckman, B.S. Eliot and Jeff Gardner.